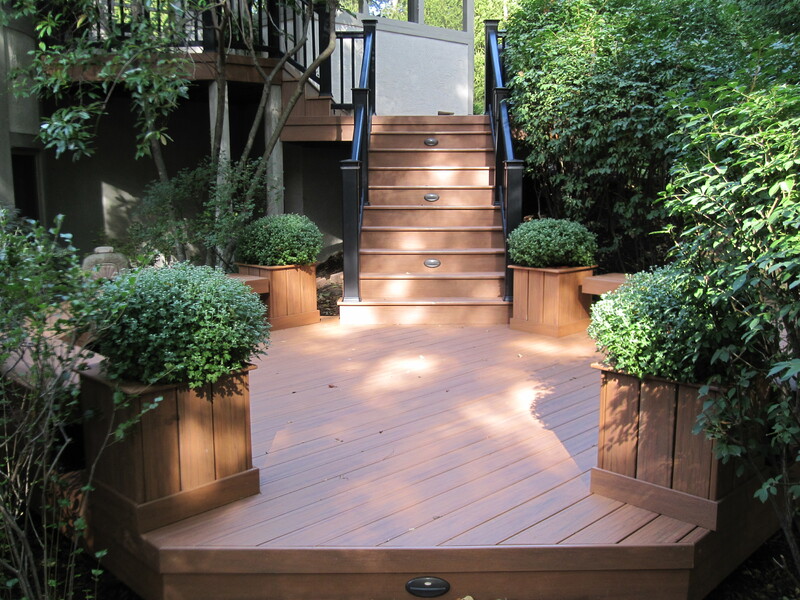 Archadeck of Columbus explores the significance of the front porch and how this beloved outdoor addition is still in high demand today. This front porch reflects the age-old design of a true American original. 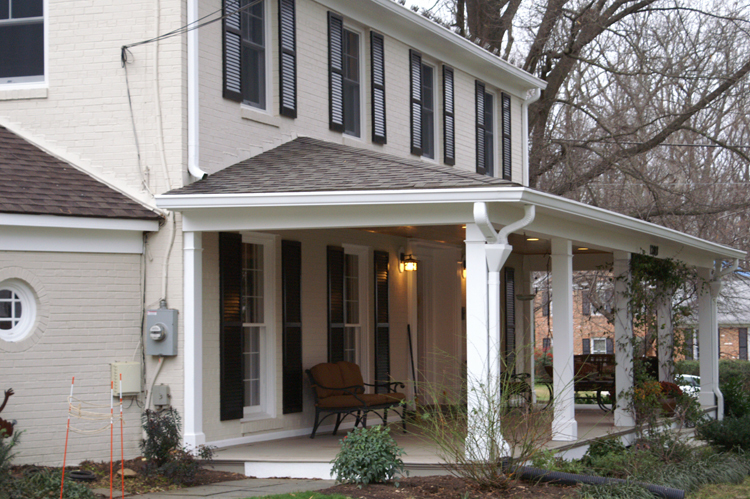 Remember back, not so long ago when the front porch served as a gathering place for families and neighbors? The idea of the front porch takes us back to a time when the world was a little more relaxed, time moved a little slower and people took pleasure in the simpler things in life. It wasn’t uncommon to enjoy a glass of ice cold lemonade over conversation and rock away the time on the front porch, or even enjoy a little front porch guitar on those sunny Columbus afternoons. Although homeowners today generally focus their outdoor living attention to the back of their homes, front porches are still in high demand. Not only do front porches serve a functional purpose of covering the area around the front door, but they also provide maximum curb appeal to a home. 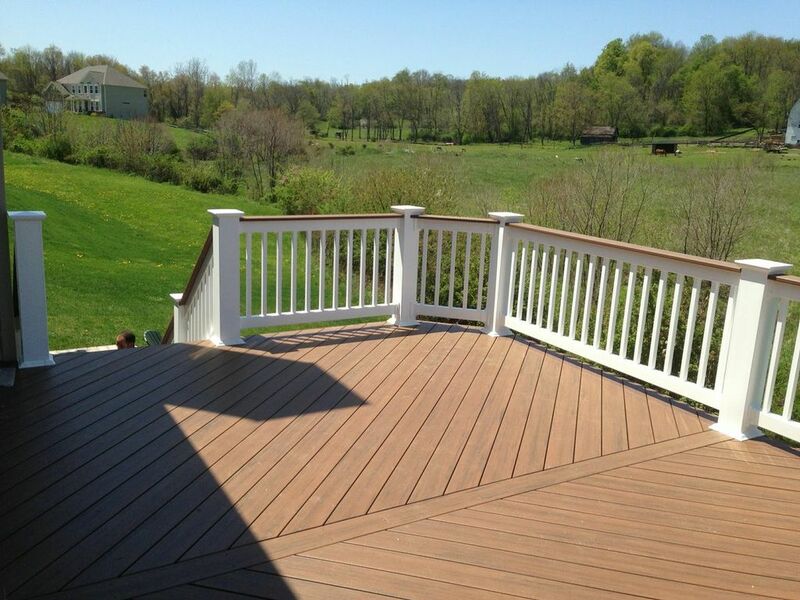 Archadeck of Columbus receives many requests for front porch additions. 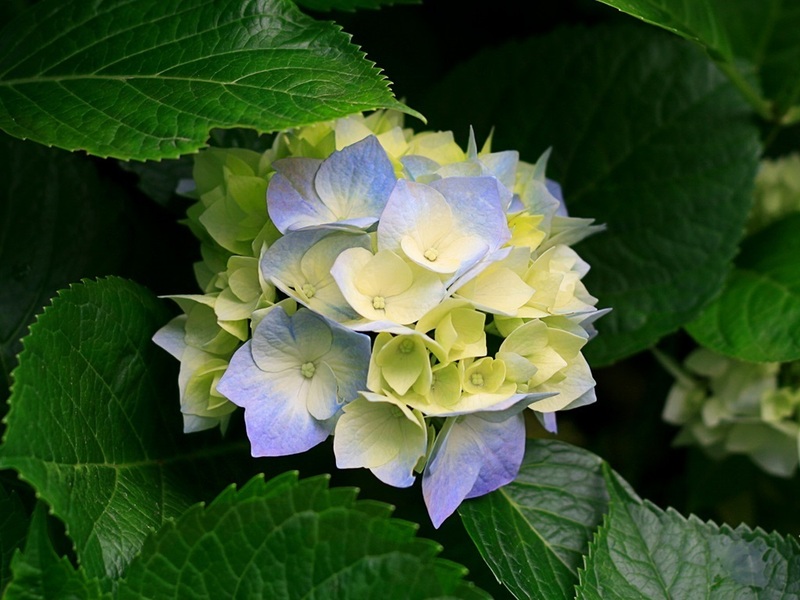 These requests stem from homeowners looking for a way to improve the beauty of the front of their home, and to provide a more suitable way to mark entry into the home. 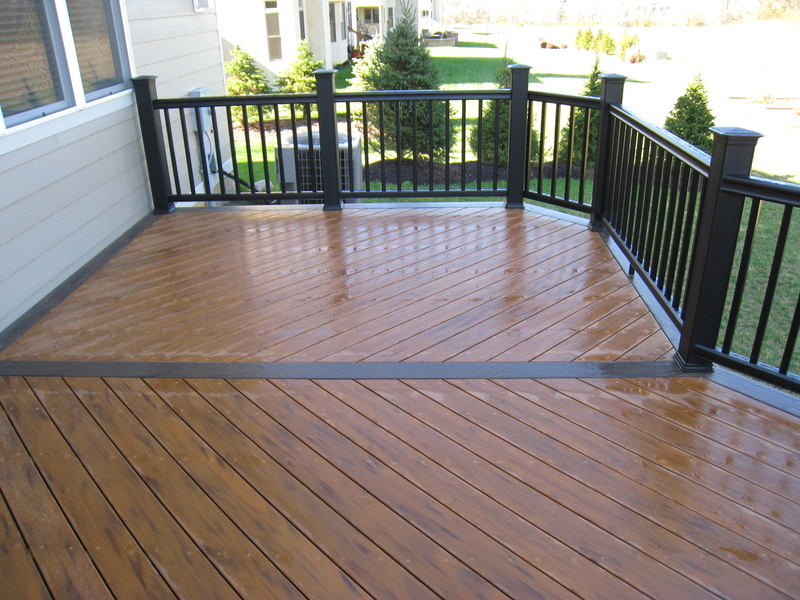 Like all porches we build, we always try to match or compliment the architecture and colors of your existing home. 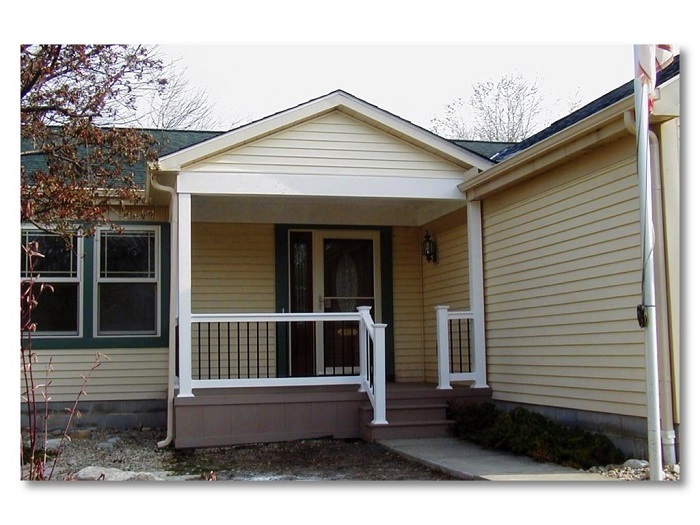 Our goal is to design a front porch addition that looks original to your home; like it has always been there. 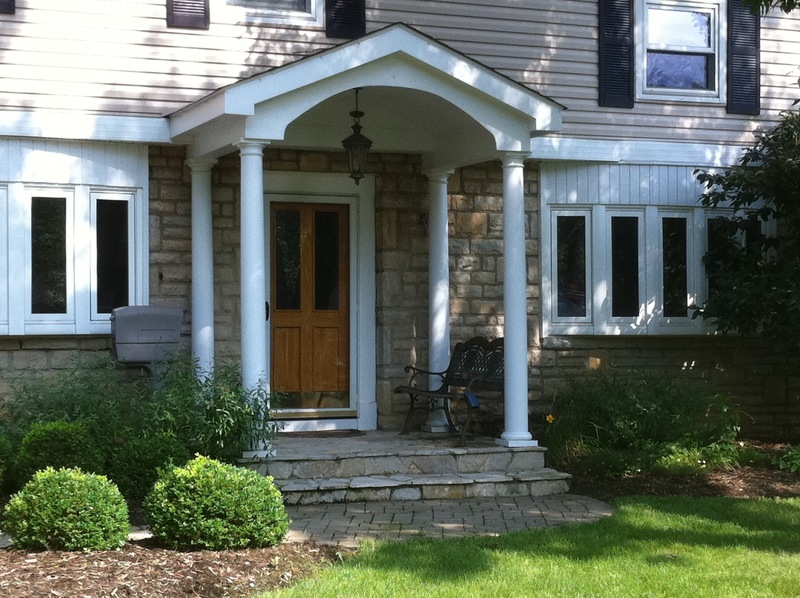 On this front porch in Columbus, OH we brought in different stone to match and compliment the home’s front facade. Even though the stones are different, they work together beautifully on this relaxed front porch design. Four columns add elegance to the curved roof design as well. This front porch is a more updated version of the beloved “rocking chair front porch” of yesteryear. By using an open air design combined with square columns, Archadeck of Columbus transformed the curb appeal of this home. On older front porches we will often use vintage style wood from historical districts the way it was originally designed to be used to build the front porch. 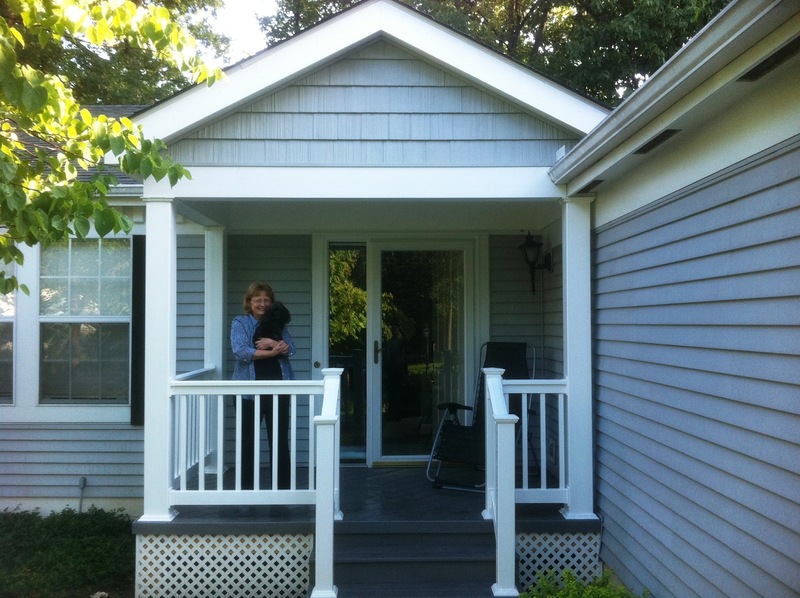 This front porch was built using low-maintenance materials with a TimberTech composite floor and vinyl railings. Today’s porch material options far exceed the porches of the past as they are easier to maintain and built with longevity in mind. Many homeowners opt for closed gables in their front porch design because it gives the porch more protection from the elements. 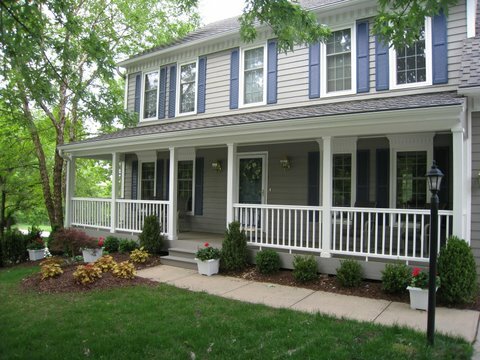 Keep in mind that a front porch doesn’t have to be large in order to make a huge impact on the front of your home. This front porch is built to accentuate the design of this home. Built using low-maintenance materials in colors that compliment the existing home while still providing plenty of room for a chair, it’s a resting place for the umbrella and room to kick off your shoes after a long day! Please visit our portico and front porch photo gallery located on our website to see more inspiring examples of entrances worthy of a second glance. Thanks to TimberTech for a great plant tour! Last week we were graciously invited and hosted by TimberTech for a plant tour in their Wilmington OH plant location. During the visit, we had an extensive plant tour, learned about some new products that are already on the market and even got a sneak preview of a couple new items that are coming to market soon. TimberTech has extensive product testing and research laboratories. These labs simulate weathering conditions including heat, sunlight, rain, and even moldy conditions. The TimberTech line of products are exposed to strength tests and pushed to their limit to ensure their products last and fulfill the promise of the 25 year warranty. We then took to the plant tour and were able to see the raw materials in mass quantities. These included polyethylene and wood fiber. Different compositions are used depending on the particular boards. We then looked at various extrusion lines producing different boards. We were also able to see the mass scale of the logistics and distribution operation. Rail cars make a direct stop right outside the back door and lots are stacked with thousands and thousands of completed boards. In addition to rail loading and unloading, there is a facility for tractor trailers which come and go all throughout the day. We were able to see the major plant expansion as TimberTech is consolidating manufacturing operations to this plant. As you may or may not know, TimberTech and AZEK joined forces last year giving the combined company a more expansive line to surface nearly any outdoor living space. 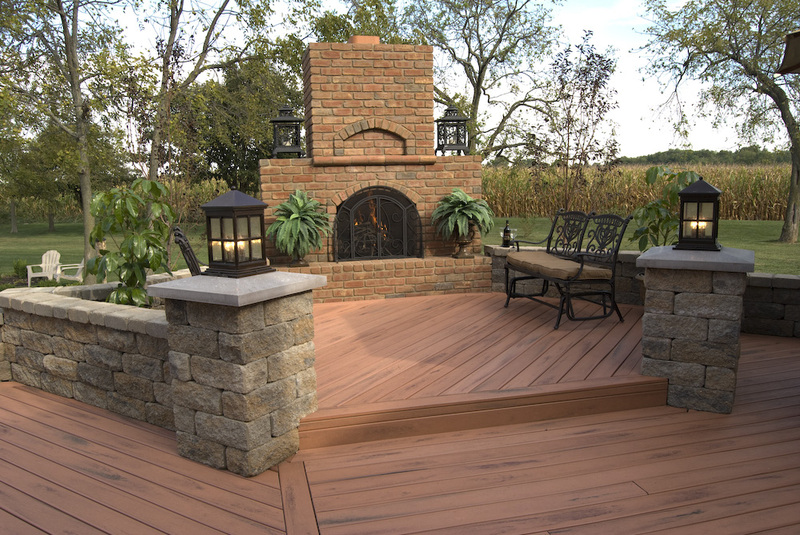 Both TimberTech and AZEK have strong and expansive lines of products within the low maintenance outdoor living materials markets. These include not only floor products but also railings and lighting. After our plant tour, we watched a demonstration of the new AZEK Vast pavers. This line includes landscaping, permeable, and resurfacing pavers. The pavers are made up of 95% recycled materials. While the paver looks every bit like traditional pavers, they are anything but traditional in their makeup. The recycled materials make the paver lighter and less breakable at the same time. While concrete pavers chip and break, these pavers are strong, solid, and low maintenance. The installation system is based on locking in to a grid for easy installation. We also had a sneak preview of some new products that are coming to market. We will be able to share more about those in an upcoming blog post. 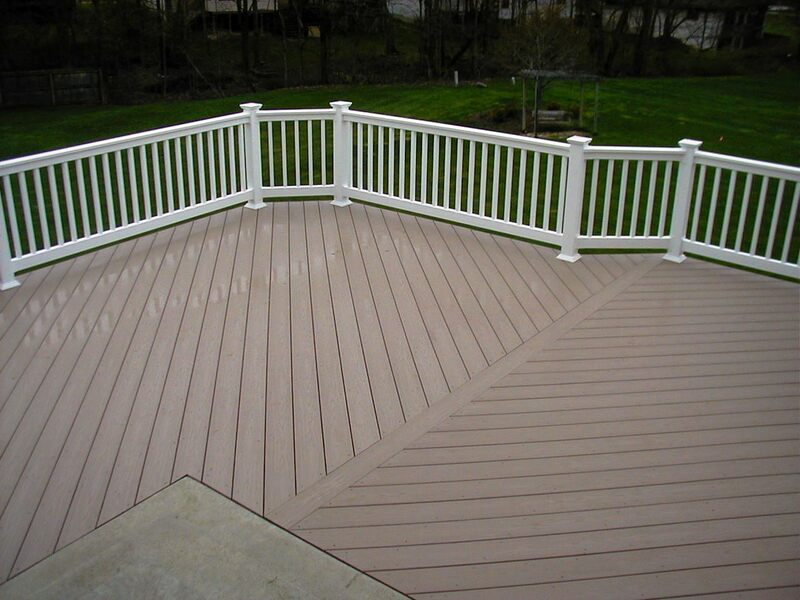 If you’re considering adding a deck, patio, porch, or other outdoor living space to your yard, give us a call for a free consultation. Read more about TimberTech on their website. Author archadeckofcolumbusPosted on October 22, 2013 Categories TimbertechTags Archadeck of Columbus, AZEK pavers, permeable pavers, Timbertech, Vast paversLeave a comment on Thanks to TimberTech for a great plant tour!